NEW YORK (F.A.S.T. Graphs) -- Buffalo Wild Wings (BWLD, colloquially known as "B-dubs" was founded three decades ago with a single location. Today, Buffalo Wild Wings has 960 restaurants, 538 of which are franchised and the rest company-owned. "It all started in 1982 with one restaurant in Columbus, Ohio. Since then we've grown to have a store in almost every state in the U.S. (sorry, Rhode Island) and continue to open B-Dubs around the world (you're welcome, Earth)." True to the company's core values of "Beer. Wings. Sports," roughly 40% of the business is derived from wings and 22% is a result of alcohol sales. (I couldn't find data on the amount that comes from consistently offering sports viewing options) The wings portion of the business is especially impressive given fact that McDonald's (MCD - Get Report) , a much larger restaurant operator, has been unsuccessful in developing the chicken wing market. In 2012 Buffalo Wild Wings had system-wide sales of $2.5 billion and is working to reach 1,700 locations in the intermediate term. Of late Buffalo Wild Wings has been nothing if not a growth story. Over the past five years unit locations have grown by 13% a year, revenue has averaged 25% yearly growth and net earnings have increased at a per annum rate of 24%. Next year the company is targeting a goal of 20% net earnings growth. Aiding in this fast growing stage is Buffalo Wild Wings' recent partnership with PepsiCo (PEP - Get Report).This creates the opportunity to add new snack food options, much like PepsiCo's partnership with Taco Bell to create the Doritos Tacos. Additionally, the deal could also allow Buffalo Wild Wings to tap into PepsiCo's major sporting organization connections with the National Football League and Major League Baseball. It shouldn't be difficult to see that Buffalo Wild Wings has been an exceptionally strong company of late and continues to have increased growing opportunities. For instance, by utilizing the Fundamentals Analyzer Software Tool of F.A.S.T. Graphs below we can see that Buffalo Wild Wings was able to increase operating earnings (orange line) by almost 25% a year since 2003. Although the company does not pay a dividend, it's clear that the company has been able to put its earnings to good use. In addition, the performance results during this period have been especially spectacular. A hypothetical $10,000 investment on 10/31/2003 would be worth over $130,000 today -- a nearly 29% annual gain and over six times what a comparative investment in the S&P 500 index would have achieved. For those looking at the future prospects of the business -- along with the past results displayed here -- it seems that Buffalo Wild Wings is an especially compelling company. Thus, when you find out that the price has dropped by about 5% in less than a month, you might be thinking this could signal an opportunity to take a closer look. In the case of Buffalo Wild Wings, however, I would express great caution on this front. On Nov. 21 shares traded near $152 as compared to Thursday's close of just above $142. Yet what is not apparent from viewing short-term price action alone is the idea that business operations and price movements can vary largely from one another. In the long term, price generally catches up or falls back toward long-term earnings prospects, but in the short-term anything can happen. Or in Ben Graham's words: "In the short term, the stock market behaves like a voting machine, but in the long term it acts like a weighing machine." Today, Buffalo Wild Wings offers a perfect example of a stock that has become disconnected from its underlying earnings. 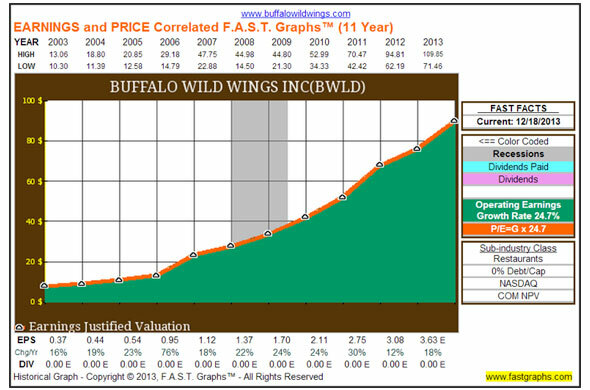 Below I have included the Earnings and Price Correlated Graph for Buffalo Wild Wings. Note that this graph is precisely similar to the one above, except now it plots price (black line) along with operating earnings over time. 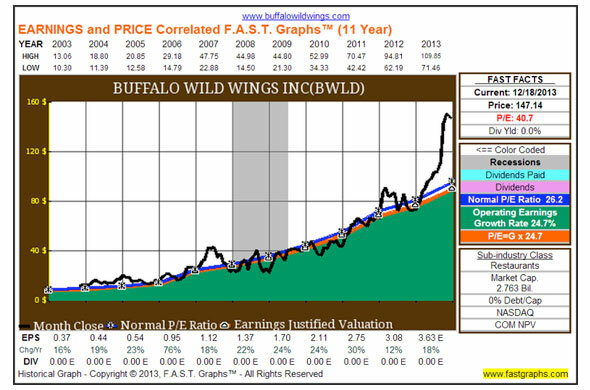 Notice that Buffalo Wild Wings' normal P/E ratio over this time period has been about 26, and up until this year the stock price more or less oscillated about this mark. Recently, however, the price has jumped exorbitantly -- to a P/E ratio above 40 -- while the earnings continue to move along. In other words, the recent 5% price decline is minor in comparison to where the company has historically traded. Now, this is not to suggest that the company's prospects are underwhelming -- quite the contrary. However, I would like to use this article to indicate what assumptions one is making when looking to initiate a partnership with Buffalo Wild Wings today. Below I have included the Estimated Earnings and Return Calculator for Buffalo Wild Wings. It's important to underscore the idea that this is simply a calculator, but it does provide a solid baseline for how analysts are presently viewing the company. Specifically, it indicates that 20 analysts reporting to Standard & Poor's Capital IQ come to consensus earnings estimates of $3.63 and $4.42 per share for the upcoming fiscal years, and an estimated earnings growth rate in the intermediate term of 20%. 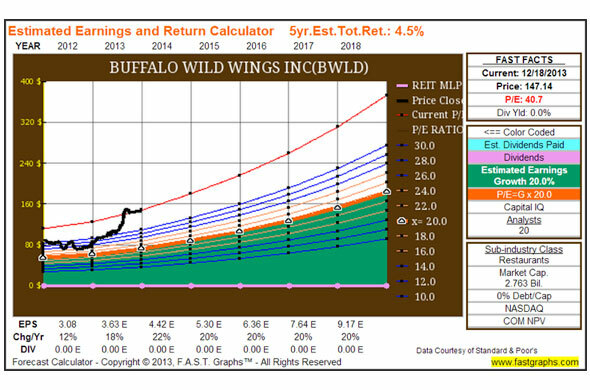 In addition, if these forecasts come to fruition and Buffalo Wild Wings trades at 20 times earnings, in five years this would indicate a 4.5% total estimated annual return. Obviously a higher expected growth rate of P/E ratio would lead to a higher expected return, but it's important to remain prudent in these expectations. For instance, while the company could grow faster than 20%, it certainly wouldn't be cautious to plan on 30% growth. After-all, the company was unable to do that in the last five years when it was much smaller and management has indicated a target growth rate goal of 20% for next year. Further, while a P/E near 40 in the future might indicate performance results that roughly tracked business results, this assumption certainly isn't erring on the side of caution. Overall Buffalo Wild Wings appears to be a very strong, fast-growing company with great potential prospects. However, today's valuation leaves little in the way of a "margin of safety." The company must grow quite fast -- by 20% or more -- and command a P/E ratio well above the market to make for a compelling investment. This is not to suggest that it can't happen, but rather to indicate that current prices reflect this significant growth expectation in the future. As always, I recommend that the reader conduct his or her own thorough due diligence.